Earlier this week Somerset House opened its West Wing to the elegant Behind the Mask exhibition. 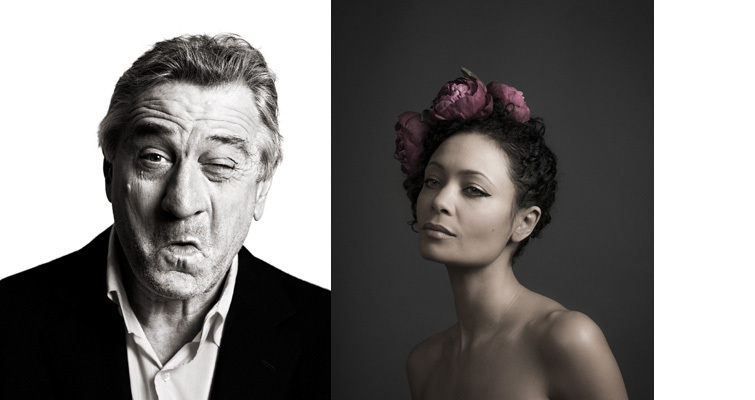 Behind the Mask is a collaboration between established celebrity photographer Andy Gotts MBE and BAFTA Future Archive. With the support of the Ruhan Arts Foundation, Andy Gotts spent two years travelling and photographing celebrities such as Daniel Day-Lewis, Al Pacino and Tilda Swinton. The thing that these celebrated actors have in common is the fact that they have won or have been nominated for a BAFTA award. The emotive portraits span a number of minimal rooms that invite the viewer to remember the most celebrated films and characters in history. However these celebrated characters are not what are portrayed in the portraits. Each photograph is a snapshot of the actors’ own character, reminding us that the actors are very much themselves behind the mask they put on in films. Behind the Mask is an enjoyable exhibition that celebrates the personalities of the world’s famous actors and the photographic talent and dedication of Andy Gotts. A must see. This entry was posted in Events and tagged actorsportraits, alpacino, andygotts, andygottsmbe, arts_london, bafta, behindthemask, danieldaylewis, London Visual Arts - LoVArts, LoVArts, photography, portraits, ruhanartsfundation, somersethouse, tildaswinton. Bookmark the permalink.